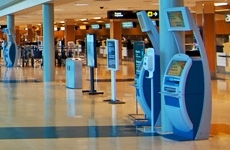 Victoria International's art program currently consists of a commissioned collection and on occassion special exhibits. 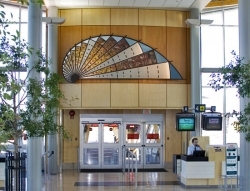 In December 2006, the Victoria Airport Authority launched the rotating art component of the program. 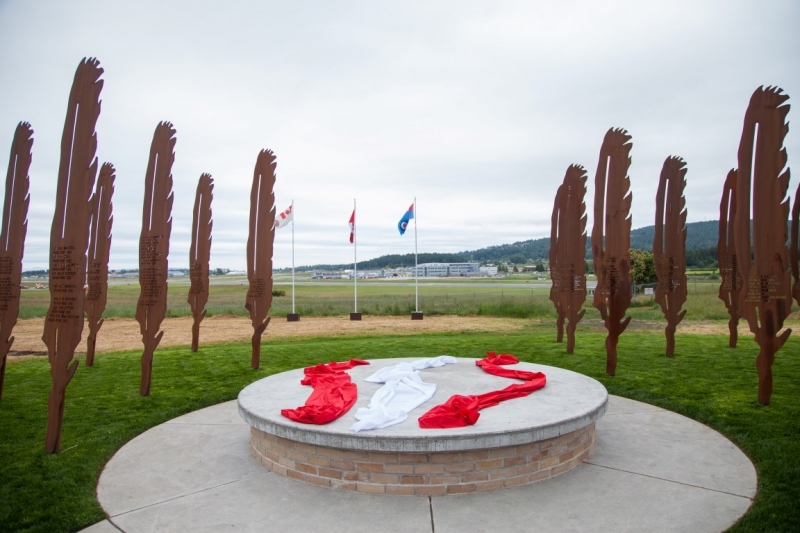 "The Lost Airmen of the Empire" sculptural monument at Hospital Hill honours the Allied Airmen who gave their lives at the Patricia Bay Air Station during the Second World War. It was created by Victoria Sculptor Illarion Gallant. 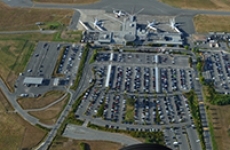 Hospital Hill, located along Mills Road on the North side of the airport, was home to the Medical Facilities for the Royal Canadian Air Force (RCAF) Station Patricia Bay during the Second World War. 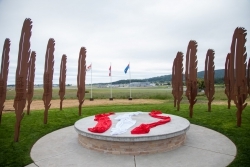 This monument was selected by the VAA and a group of citizens who formed a working group that had the common goal of increasing the awareness of the proud military history of the airport. Approximately 1,000 salvaged bricks from the previously demolished military administration building have been saved and will be incorporated into the project. This monument recognizes and honours those who gave their lives while serving at the airport during the Second World War. The main feature of this sculptural work is twenty-five 12-foot high Corten Steel Cooper’s Hawk Feathers. The Cooper’s Hawk is a predator known for its extraordinary agility in flight and ferocity in hunting. The names of the lost airmen are water jet cut into the feathers. The area surrounding the monument is landscaped and a row of red maples stands on either side of the path leading to the memorial. Seating areas feature the saved bricks from the RCAF headquarters. The central seating also serves as a memorial capsule filled with military memorabilia and letters to veterans written by our community. 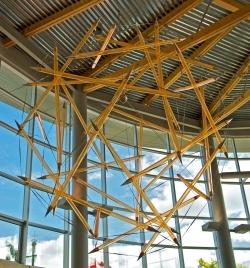 This tensegrity structure has 20 faces,30 struts made of light gathering acrylic tubes and 90 stainless steel turnbuckles connected to aircraft cable radiating from the aluminum core. The shape is truly intriguing when the viewer realizes that none of the acrylic tubes are touching. 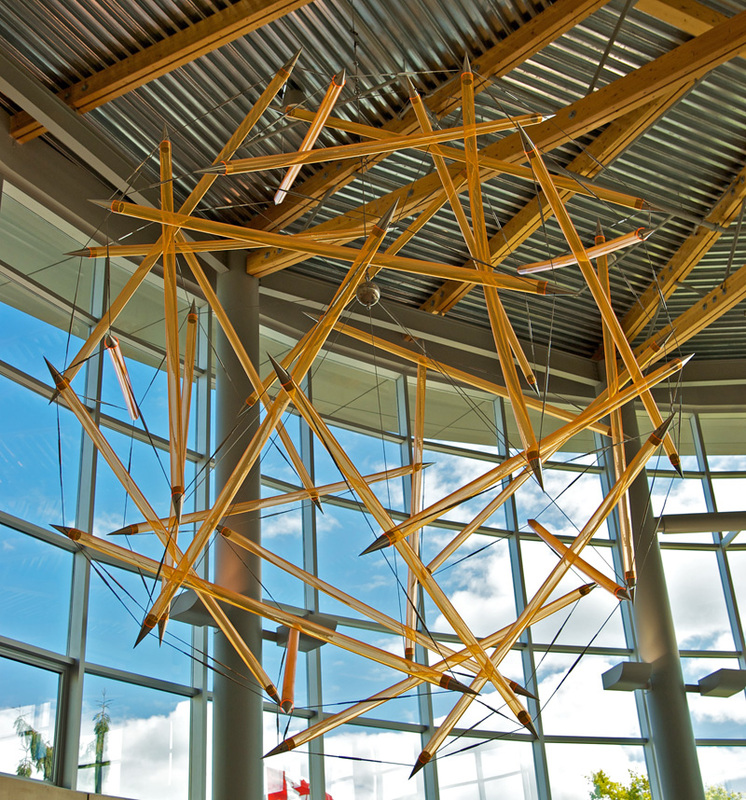 The structure is attached to a graphite pole that is connected to a wind vane on the roof to create its movement. The artist wanted the piece to represent a system in dynamic equilibrium. A large simple object that moves in a seemingly random weightless way - to be caught in the peripheral vision of people waiting below. The awareness of the huge object gently moving at the edge of someone's vision might cause a lapse for a second or two, a pause for reflection - Robert Wise thought that that's what art should do. Over the past decade Robert Wise established himself as a unique figure with West Coast sculpture through the production of mechanically sophisticated machines. The impetus behind the idea for the artwork "Genesis" is the celebration of the harmonic structure found in nature. Linda Stanbridge has chosen the seashell to represent the harmonic proportions reflected in growth patterns evident in the world of plant and human life. The spiral form of the shell is mirrored in the shape of galaxies, the swirling patterns of weather, and even in the structure of the universe itself. The geometry of the shell as well as being universal is also very particular to our geographic location, our island on the West Coast and the area surrounding Victoria. Linda Stanbridge was born in Glasgow Scotland and presently lives and works in Victoria, British Columbia. She exhibits her work both nationally and internationally and is represented in numerous public and private collections in Canada the U.S. and Europe. Her art practice has grown out of an interest in geometric structures and the dynamics of optics as experienced by the viewer. 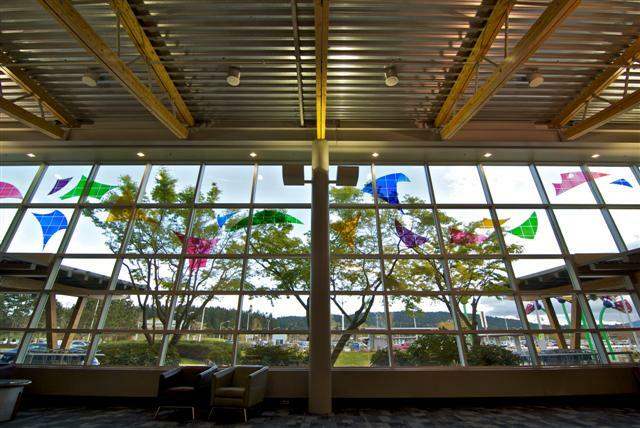 Brightly coloured aluminum and steel scuplture situated across the frontal road from the departures area. 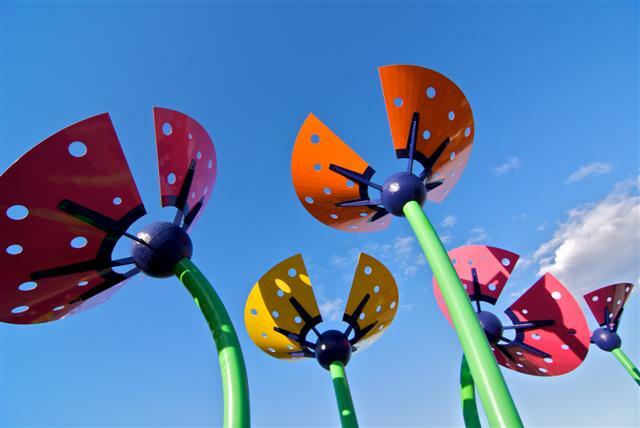 The sculpture really is a bouquet of memories as Gallant invited all students and staff of his neighbourhood school to write a paragraph of their favourite memory. The collection of memories is sealed in a capsule inside the seedpod of one of the colourful poppies in the sculpture. 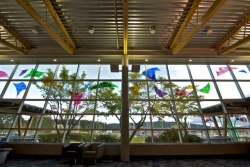 A series of hand-blown stained glass panels along the length of the interior glass wall of the departures check-in area. Thomas Mercer and Edward Schaefer are becoming increasingly internationally renowned for their exquisite stained glass artwork. 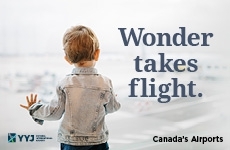 Other works include 36 windows in the BC Government House Ballroom and a gift to the Queen of the Queen's Golden Jubilee stained glass window in the Legislature which was unveiled during the Queen and Duke of Edinburgh's visit to Victoria, BC in 2002. 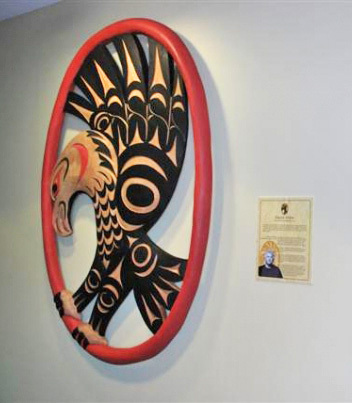 This totem depicts one of the most important historical legends in Coast Salish history. The Thunderbird seen on the tail of the orca is a spiritual being and can only be accessed through communication with the creator. It is usually a plea for help. The orca is the most respected creature of the sea. It is held in very high respect by Coast Salish people because of its physical powers and superior intellect. They survive in packs like wolves and are sometimes designated in the same realm as wolves of the sea. A coming together of thegreat spiritual power and awesome physical power can be seen as a balance of power beneficial to mankind as seen through First Nations beliefs. In the past, human figures were carved in much greter than life size. They stood in front of villages with hands and arm held in a welcome gesture. This welcome figure is based on a traditional Coast Salish welcome figure that would have been seen in front of villages. They faced the water and welcomed arriving visitors. The hands and arms of this figure shows the welcome gesture as well as an arm holding a paddle, showing that the people of the First Nation from Saanich are people of the canoe and paddle. These are symbols of welcome and thanks as well as survival. 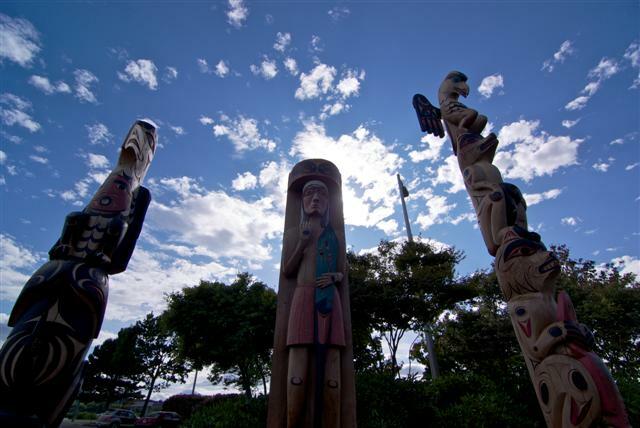 This totem is a depiction of a bird and animals held in high esteem bu the Saanich people. In the days of the past, when forests, oceans, rivers and streams were in pristine condition, animals, birds, sea creatures, and mankind of the Saanich First Nations held a close relationship to each other. They shared the space provided by our creator "XAIES"; along with a closer understanding and respect between mankind, our brothers and sisters, and other life forms which we believe we are a part of. On this pole the Raven sits atop the head of the Wolf and below the Wolf is the Bear clutching a salmon. The Raven is Saanich mythology is noted for its intelligence and is regarded as a messenger as it flies its daily path across the sky, waters, forests, and villages spreading the news of the day. This intelligent bird loves to play tricks on all including mankind as it makes its daily journey. In many First Nations culturs the Raven is acknowledged for its ability to transform into other deities further enhancing its reputation as the trickster and messenger. The second figure under the Raven is the Wolf. The Wolf at one time inhabited this ground and surrounding areas. Wolves were regarded as keepers of the night and could be heard talking to each other over great distances. They were regarded as protectors and guarded our sacred places such as the top of Mt. Newton - a place reserved for survival of such things as the great flood as well as our place for meditation, purification, and fasting and coldwater rituals. Wolf packs and Orca pods are revered by First Nations as one and the same. The Bear on the bottom of this pole is holding a salmon to show that he or she is also a fisherman and survivor. Bears are respected and regarded as our equal as family caretakers and will rigourously defend their young as does man. Bears are respected as people and can be seen fishing in close proximity to our fisherman in the shallows of rivers as the salmon journey upstream. We have a saying which says, "salmon for survival are survival for salmon." Bears believe this as do we and we have a mutual respect for each in this regard. 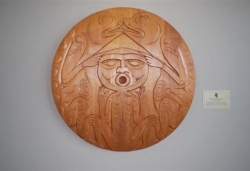 Charles W. Elliott is an internationally recognized Master Carver and fine artist in the Coast Salish tradition. His art works are in private and corporate collections worldwide. Charles is a member of the T'sartlip First Nation and was born on the T'sartlip Reserve in Brentwood Bay, BC. He continues to live there today on the shores of the Saanich Inlet with his wife Myrna and their children. As a young artist, Charles carved designs on the bark of the cottonwood tree and styled his own small totem poles and model canoes with coaching by his father, uncles and encouragement from his mother. Art and woodcarving have been a focus for Charles for the past four decades. 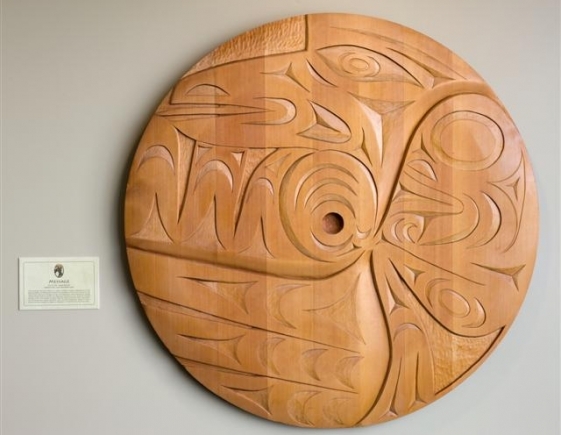 He has been inspired by his passion for the Salish art tradition. 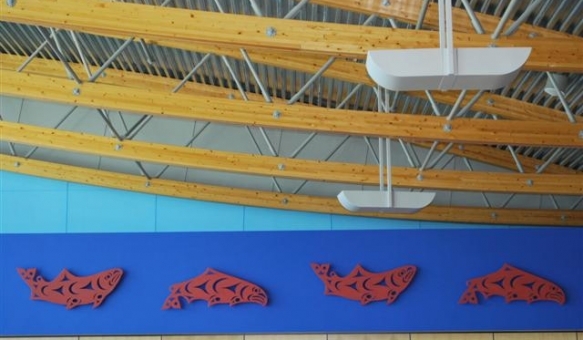 Charles' works testify to his dedication to classic Coast Salish design. He recreates traditional utilitarian and ceremonial objects as well as creates contemporary works within the Coast Salish discipline. 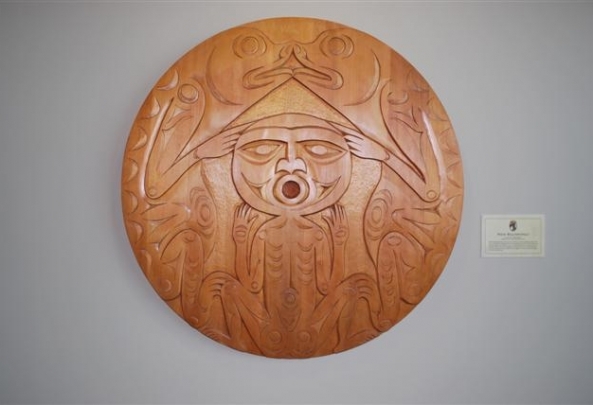 "I am a self taught artist who has taken a long, slow road to gain my knowledge and skills as a wood sculptor and graphic artist in the Coast Salish tradition. I have dedicated my life to the revival of Coast Salish art form which was once in danger of disappearing. 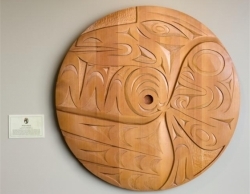 I continue to tutor young artists in the Coast Salish artistic traditions and have often taught about the history of Salish art in school programs of all levels."